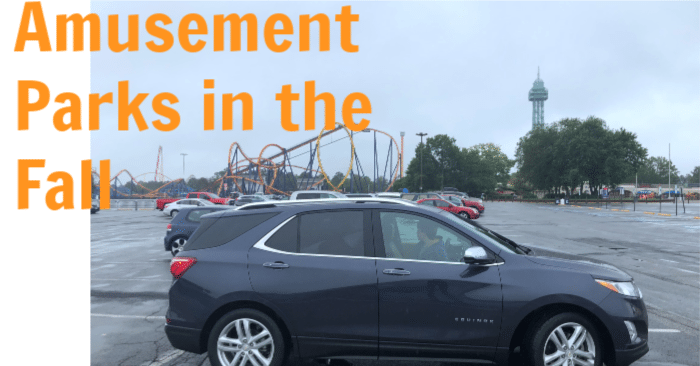 Thanks to our brand partner Cheverlot for providing us with a Chevrolet Equinox to test drive and Park Tickets to share this post about What Amusement Parks Have to Offer in The Fall. Just because Labor Day has passed does not mean your local amusement parks are closed for the season. In fact not only are you going to find short lines and cooler temperatures in the fall, but most are decked out with Fall and Halloween decor. We chose to visit the parks during the non-scary hours, but both Kings Dominion and Busch Gardens have the option of going during the dark and brave haunted parks Here are what a few Virginia Amusement Parks Have to Offer in The Fall. Heading about one hour West From Richmond you will land at Busch Gardens Amusement Park. The park is definitely one of the best-kept amusement parks I have visited. Fall time is no exception From dangling jack-o-lanterns to full displays of Pumpkins, you will feel like you have stepped into a Halloween fairyland. Fright Night starts at 6 pm so if you plan on avoiding it, make sure to plan accordingly. The only rides that were not open were the water rides. We typically avoid those anyways so they were not missed. There are several fall inspired shows offered throughout the park as well if rides are not your thing. Be sure to check Busch Gardens Williamsburg website for specific dates and times the park is open this Fall. Rain! On the day we’d scheduled our first trip to Kings Dominion’s Great Pumpkin Fest. Canceling was out of the question. The kids were so excited. And guess what? The kids didn’t even notice the rain! As in they didn’t even mention it once. In fact, if you are dressed appropriately for the chilly rain, it sure beats standing in lines on nicer days AND we were able to ride the rides over and over in succession! No need to worry about sunscreen and tons of water. I’m not sure we could go back to the other way of visiting a theme park! Our kids, ages 2, 5, 7 and 9 all enjoyed the Halloween-themed Great Pumpkin Fest at Kings Dominion. The event is definitely geared more towards toddlers and those ages five and under; my older ones could still appreciate it but they often ducked out of Planet Snoopy to ride roller coasters and “big kid rides” with my husband. In short, everyone was very pleased! The Great Pumpkin Fest takes place in the Planet Snoopy area that is already for little ones. Your family will see fun Halloween decorations and the ride operators and Peanuts characters dress in their Halloween costumes. Plus there are special exhibits like the Pumpkin Painting patch, a hay maze and a John Deere derby where little ones can pedal around the farm. There are SO many great photo-taking opportunities because of the festivities! As you make your way through the unique Pumpkin Fest locations, they pass out special Halloween “treats” to collect. My little guys were super excited about a Halloween puzzle they collected! I’d highly recommend taking your family to the Great Pumpkin Fest at King’s Dominion to get into the Halloween spirit. Just cross your fingers for rain! Kings Dominion with Teens or Tweens is just as fun as well. The kids had no lines for the rollercoasters they love which meant they really did not even notice the rain. Kings Dominion definitely had more scary decorations sitting out but since these kids are older they just left at most of them. Most of the rides these older ones were interested in were still open and they rode them multiple times. Something you can not do on a busy summer day. You might be thinking there is no way you can take a fall road trip with teenagers since so much of their homework is online these days. 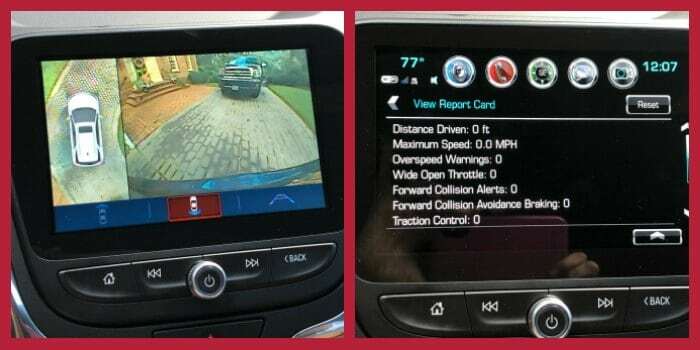 That is not true if you are driving a Chevy Equinox equipped with a 4G LTE WiFi hotspot in the vehicle which provides the connection for up to 7 devices – more than enough for the whole family to log in and get their homework done! The kids don’t have to create a hotspot on their phones and eat up data. Just connect your devices to the WiFi and you have connectivity on the road. Another feature I loved about the Equinox was the overhead camera or surround vision. This is a great feature for parking. I always have to open the door to see if I am close to the line or the curb, not anymore. Surround Vision is made up of four cameras positioned around the vehicle that create the virtual bird’s eye view – the standard rear vision camera, a forward-looking camera in the front grille and one under each side mirror of the vehicle. The Equinox is a crossover SUV but it does not feel small since almost the entire top of the car is a moonroof. Even in the rain, the boys wanted me to keep it open. The cargo space is large and it was an easy car to drive. Have teen drivers? Most Chevrolets are equipped with teen driver. Basically, you can get a report card of their driving. From the number of times, they braked hard, to near collisions. The feedback provided is a great conversation starter when discussing driving privileges!